Found in both urban and rural landscapes in Arizona, orange trees provide an abundance of fruit in the winter months. Orange trees are common to the low desert regions throughout the counties of Yuma, Maricopa, Pinal and Mohave due to the mild, snow-free winters. Plant your orange tree in September; spring planting may result in the young tree suffering distress from the intense summer heat. 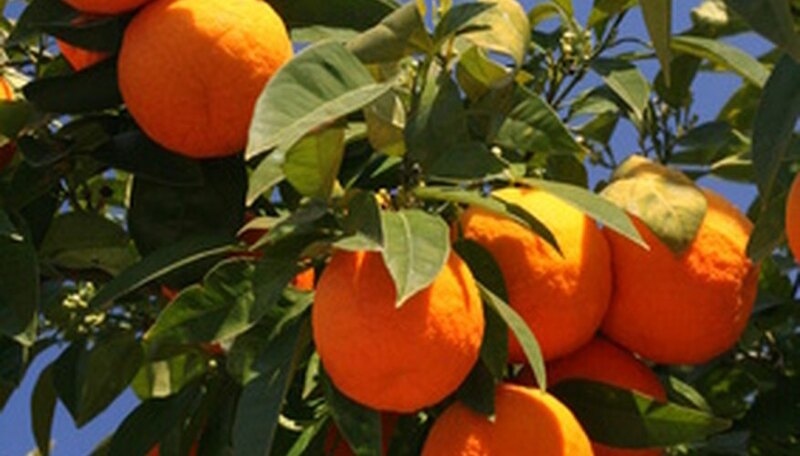 Select a location for your orange tree in which it will receive full sun. Orange trees grow to approximately 20 feet in height and have a canopy that may measure 10 to 12 feet across. Choose a location that accommodates this size. Dig a hole that measures twice the size of the rootball of your orange tree in diameter and depth. Add compost to the soil that will fill back around the tree to achieve a 20 percent to 80 percent ratio of compost to soil. Moisten the interior of the hole. Place the tree in the hole and add the soil. Allow for a small depression around the trunk of the tree. Spread any remaining compost/soil mix around the tree to serve as mulch. Water the tree every five days for the first three months. If it rains, skip the watering for a week. If watering from a hose, turn on a low flow and water for approximately fifteen minutes. If using drip irrigation, allow for 2 to 3 gallons of water. Decrease watering during the winter months to once every 14 days (less if it rains). As the tree grows, increase the watering time by a few minutes to increase the amount of water the tree receives. Paint the trunk of the tree white in early spring using a water-soluble paint. Painting the tree trunk will protect the thin bark from sunburn. Watch for curling leaves and dead branches during the summer, as these are signs of under-watering. Increase the amount of water given at each watering, but do not water more frequently. Decrease the frequency of waterings after the first summer has passed to every three weeks. If young leaves are falling off the tree, you are likely over-watering. Cut back to every four weeks. Do not add any fertilizer to your tree for the first year. After the first year, use a slow-release, organic fertilizer designed for citrus trees. Apply the first application of fertilizer in the second March after you have planted your tree. Apply again in mid-June, using only half the amount used in the March application. Prune your orange tree only after it is fully established and has produced fruit. Prune the tree in early spring after the fruit has been harvested and before the new flowers bloom. Bees are attracted to the flowering orange trees and will establish hives within the branches. Call a professional exterminator should you see a hive.